It will be first shown in the award-winning Dunfermline Carnegie Library & Galleries from 3 November 2018 – 10 February 2019. 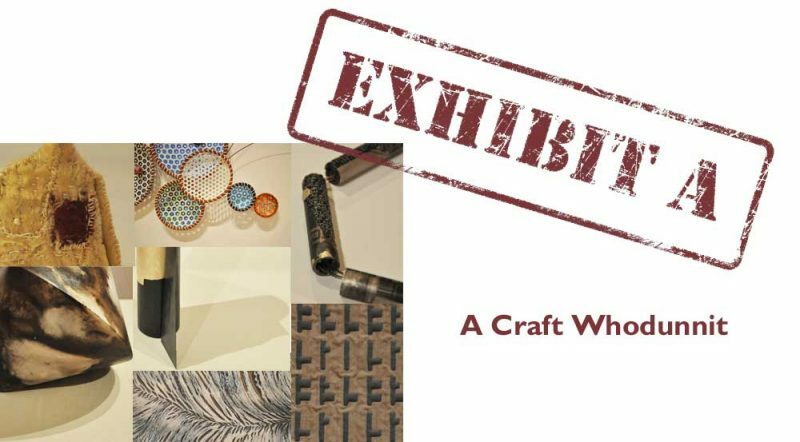 Exhibit A will feature a selection of high quality, contemporary craft coupled with an interactive approach which links to the current popularity of crime fiction and Scotland’s own tradition of ‘tartan noire’. Whilst the exhibition is underpinned by bringing together a visually stimulating display of work, it places equal value on creating an interactive experience for the audience which places the object as an amalgam of hand-skills, material knowledge, cultural influences and intellectual investigation rather than having ‘magically’ appeared before them. Statement pieces from makers working in various media, with differing approaches and motivations, will be numerically coded and displayed in one space. Within an adjoining space, supporting presentations and objects will be framed by the context of a police incident room. The purpose of this is to involve visitors in looking closely at work to decipher what it’s made from, how it’s made, any function etc. Research material, sketch books, exploratory maquettes, information on makers etc will help provide ‘clues’ and visitors will be challenged to solve the ‘mystery’ of each object, matching the exhibition pieces with their makers. Jonathan Boyd, Johanna Flanagan, Grant McCaig, Mella Shaw, Heather Shields, Amanda Simmons, Lois Walpole. Sat 24 Nov 2018 – Family Fun Day with ON at Fife Libraries! Includes a make-up artistry wound demonstration.